Close view of the gateway of the courtyard of the temples, Kalyanesvari, Burdwan District. bl.uk > Online Gallery Home	> Online exhibitions	> Asia, Pacific and Africa Collections	> Close view of the gateway of the courtyard of the temples, Kalyanesvari, Burdwan District. 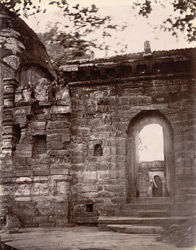 Photograph of the entrance to the temple enclosure at Kalyanesvari, Burdwan district taken by Joseph David Beglar in 1872-73. J.D. Beglar reported that, "These are temples of no great date, but curious." Although it incorporates pieces of stonework from an older structure at this site, the gateway we can see in this photograph was constructed relatively recently. It was built in the traditional, 'horizontal' Hindu style and is formed by the massing of small pieces of masonry, each addition pushed in front of the last a little more. This is quite different to the Islamic method of arch construction in which the pieces are arranged so that each part pushes against the others to hold the whole together. In this way the load is transmitted to the walls and a larger space can be enclosed.